NEW: Comprehensive Group function for your machines! 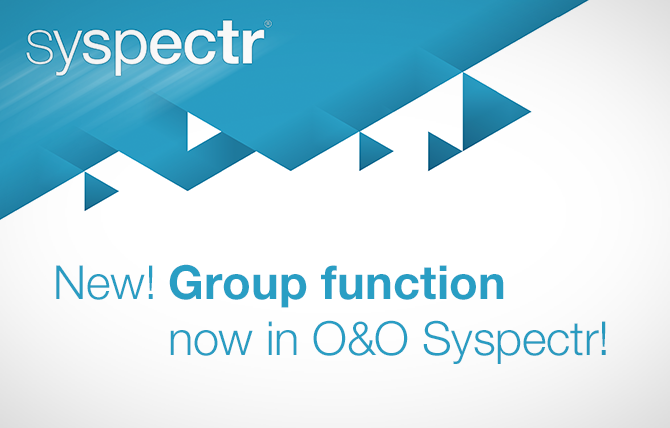 We are delighted to announce the release of a brand new Group Module in O&O Syspectr! With groups you can organize your computers and thus make settings for an entire group of computers. Likewise, you can get information about an entire group. Simply click on the group’s tile to see its overview. You can also create a new group with the “Create new group” option. In the “Overview” section of the group you will get a summary of the group with information about the number of included computers and the last connection of one of the computers. In the list of computers you can read the last event of the computer and its current status. The group “All computers” is always automatically created by the system and contains all your computers in your account. With this group you can distribute global settings to all your computers. O&O Syspectr is ready to go in 5 minutes: Create account, install the client, done! In addition to internet access, no additional infrastructure is required. Suitable for organizations of all sizes. The admin interface is suitable for desktops, smartphones and tablets. Once this is done, the necessary system information will be transferred and saved, available for you to then see and access over your account. During transmission and storage of your data, it will be encrypted and secured using the latest standards. Lost the ability to send messages to groups with this update. Yes, that is true. We are revising this component and it will be back soon. Then even smoother working than before! So please be patient! The new sending messages to computers, groups, and even all computers has been released!